Thank you to Backyard Candles for providing me with product for my review. All thoughts and opinions shared below are my own. I am a candle lover! I have them all throughout my home and if I am home, they are burning. I have a post it on my door to remind myself to blow them out before leaving my house because I have left and not done that before. I was excited to learn more about Backyard Candles. They are very unique and smell delightful. I can't wait to tell you about them! I received my package from Backyard Candles and loved them as soon as I opened them. I couldn't wait to use them because I was already enjoying the smell before I even lit them. But, one of my favorite things about these candles were that they were poured into a coconut shell. Coconut is probably in my top 5 of favorites! I love the taste, the smell and the feel of coconut and I was super excited to see coconut shells! The Gingerbread House smells amazing!! Since it's a couple days until Christmas, I decided to use the Gingerbread House candle first. Oh my goodness...this smells amazing! Aiden had been at basketball camp and when he walked in the house he asked me if I had made cookies. This candle burns very clean and even with very little smoke. These will be some of my favorite candles. They are the perfect last minute Christmas gift for the candle lovers on your list. 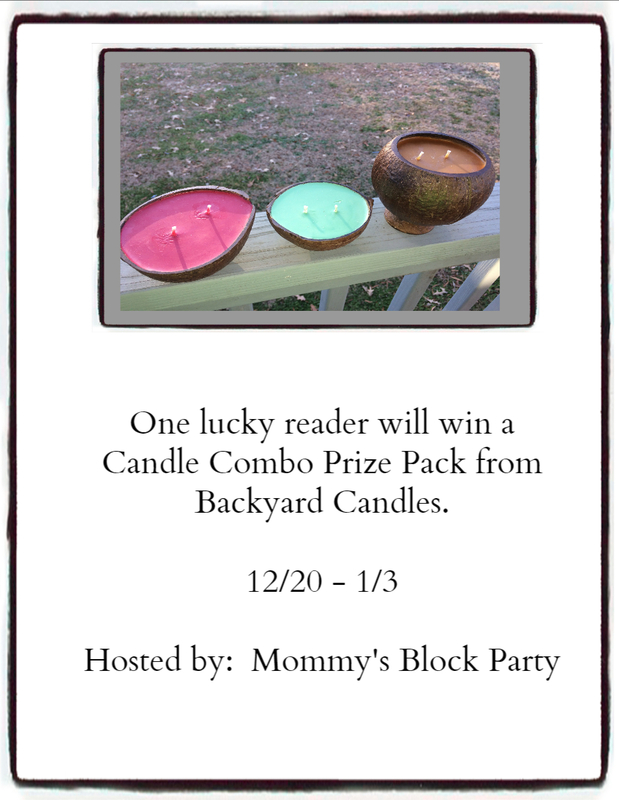 Backyard Candles is a simple story. I like candles. The way they smell. The way they burn. And the way they create light. 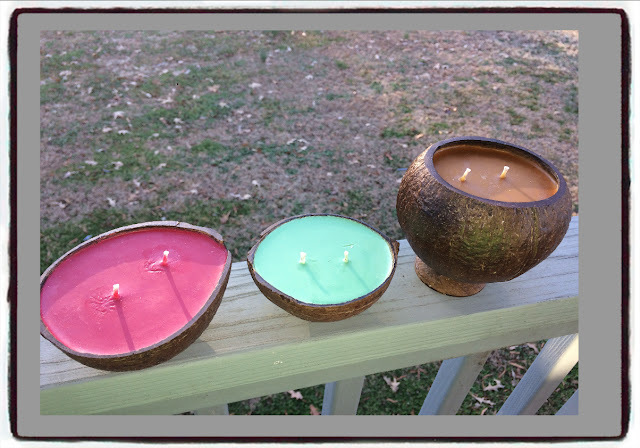 When making candles I looked at all three of those aspects and worked tirelessly till they burned perfectly, AND SAFELY in coconuts. I set out to find the purest, best soy wax the market could deliver. The strongest, most potent essential oils and fragrances available. The most effective, but slowest burning lead-free wicks. And the most unique ways I could incorporate the three in a way that allows candles to be more than just nice smelling, pools of wax. Backyard Candles come in the purest form, no exceptions. That's why our motto is "from mine to yours." All Natural. Eco-Friendly. Sustainable. Renewable. Lead Free. Non-Toxic. Hand Poured. Small Batches. American Made. Quality Candles. Burn longer, Brighter and more Beautiful. Head on over to Backyard Candles to find the perfect candles for you! You can also connect with them on Facebook, Twitter, YouTube, Pinterest and Instagram. Special thanks to my friend, Justin at Backyard Candles! These are amazing and I'm so glad that I was able to share them with all of our wonderful readers! I like cinnamon smelling candles. I like fresh scents like beachy ones. It depends on my mood. I do love vanilla and lavender. Yes I burn candles all the time. There are pretty and they sound so nice! Yes we love candles and burn them regularly. Yes I burn them often! I burn candles often, I love the smell! I like to switch up scents . I have a few favorites, but I think I would really like to try the gingerbread one! I like fruit scented candles. I burn candles a few times a month. I burn candles all the time! My favorite scent is lavender!